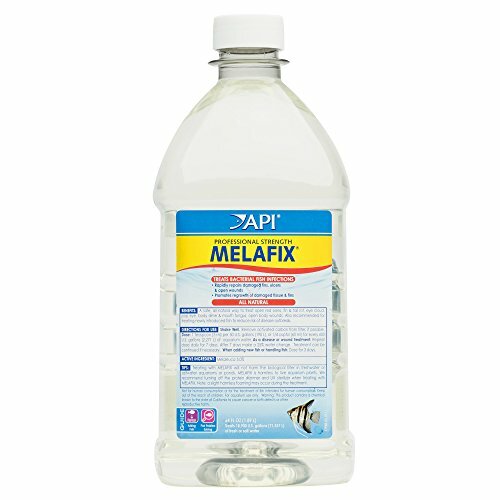 API MELAFIX Freshwater Fish Bacterial Infection Remedy soothes the transition from store to home by reducing the risk of your fish developing a disease. The fish you bought may already carry a disease. Disease is often difficult to detect, particularly in its early stages. Treat bacterial infections in your fish and reduce the risk of spreading illness to other fish with API MELAFIX Freshwater Fish Bacterial Infection Remedy. Bacterial diseases are caused mostly by dirty aquarium conditions and the addition of infected fish. Fish that are injured and have open wounds are especially susceptible, even in seemingly clean tanks. Bacterial infections, like fin and tail rot, eye cloud, pop eye, body slime and mouth fungus destroy tissue and other organs, and if left untreated, can cause death. API MELAFIX Freshwater Fish Bacterial Infection Remedy is an all-natural antibacterial treatment that heals open wounds, treats bacterial infections and promotes re-growth of damaged fins and tissue, usually within a week. Just add 5 ml per 10 gallons of aquarium water. It will not adversely affect the biological filter, alter the pH or discolor the water. For effective treatment, dose infected fish daily for 7 days, and continue afterward if necessary. Dose new fish daily for 3 days. Remove activated carbon from filter before use, if possible. With API Aquarium products, it’s easy to keep a beautiful saltwater, freshwater or reef aquarium. For over 50 years, API has been creating innovative, research-driven solutions that make it easier to care for your fish and aquarium. API Aquarium Treatment Supplies are designed to work in conjunction with each other to provide best results to control algae, promote healthy bacterial growth and help control and cure fish diseases and conditions such as ich and fin rot. They work to provide a safe, hospitable environment for fish such as tropical community fish, cichlids, goldfish and more. With API, you can spend more time admiring your fish, and less time scrubbing your tank. Make sure to use all products as directed in order to ensure the best results.